Welcome to Part 3 in a series, "My New Student Doesn't Speak English." In case you missed Part 1 (Environment) and/or Part 2 (Instruction), I'll put links to both at the bottom of this post. 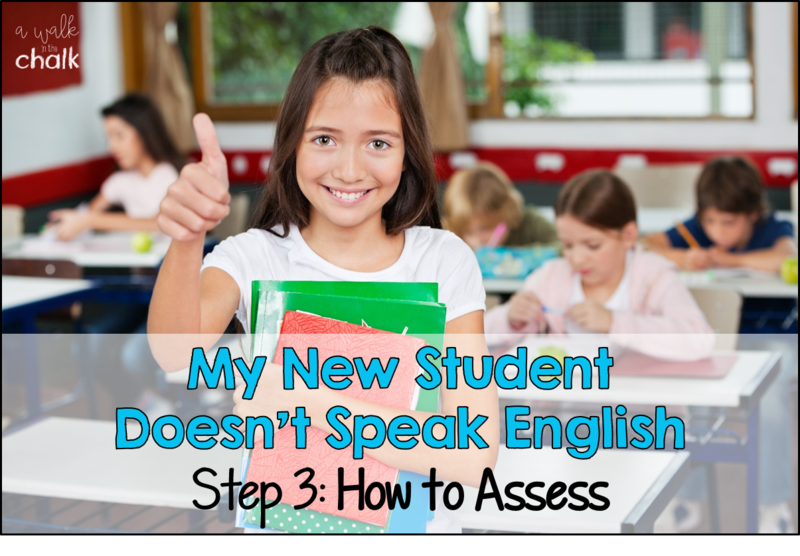 Today I'm going to share with you some tips and strategies to help you assess your beginning English Learner student(s). We can't asses our newcomers the same way we would our native English speakers, or even the same way we would with our intermediate or higher level ELs. Imagine that you are a student who just moved to a foreign country where you do NOT speak the language. I imagine myself being in China, a place where the alphabet system is completely different. I'd be absolutely lost there, yet I'd be expected to learn the same content as native Chinese speakers AND I'd be assessed and graded on my knowledge of that content. Can you imagine?!?! Personally, I'd be a deer in headlights with an extremely high level of anxiety! MUST- DOS...modify assessments, provide alternative assessments, allow your students to "show" what he/she knows in a way that he/she can. In the beginning, non-English speakers may only be able to point, or gesture, or use limited vocabulary. Soon they can match, identify and label. Is this more than they could do? Yes? Progress! CAN-DO Descriptors show YOU what your ELsHo "can do" at each level of language proficiency. Visit the website below, and on the right hand side, under "Downloads & Products," you'll see the descriptors organized by grade level. Print out your grade level. I keep a copy in my lesson plan book. This really helps me choose the best ways to differentiate instruction and assessments according to my students' proficiency levels. Below are the descriptors taken from the above charts to show what a Level 1 student CAN-DO. Notice the verbs. When thinking about how you will assess your newcomer, think about how they are able to "show" you what they know. In order to set students up for success, we need to provide tasks that our English language learners "can do." Giving them the same assessment as their native English speaking peers will not give valid results if the students can't understand what is being asked of them. 1. Simplify and reduce the language. 3. Provide scaffolds, like word banks or sentence stems. 4. 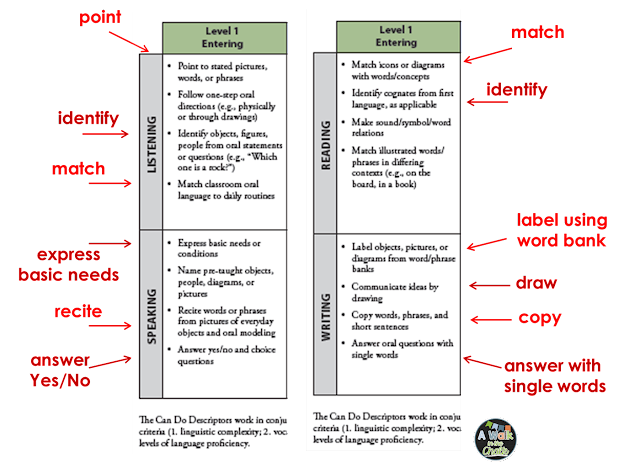 Use the CAN-DO descriptors to help create a modified assessment. 5. Test key concepts/essential knowledge. At times, if my newcomer does not perform well on an assessment, I will take a close look at the type of assessment I gave and think about 2 things in particular...First, did I teach it in a way that they understood, or do I need to reteach? Second, did I provide them with an appropriate assessment? Perhaps I'll give them an opportunity to show what they know using a different format. With a welcoming and safe environment, instruction that is carefully planned with appropriate scaffolds, and assessments that are differentiated and modified, your newcomers will grow, learn, and be successful in their new educational setting. I hope you have found this information helpful. I'd highly recommend printing out a copy of the Can-Do Descriptors and keeping it in your plan book. Along with the descriptors, there is a chart called "Can-Do Name Charts." These are fill-able charts so that you can add your students' names under their level of proficiency. What a great tool in helping to differentiate for our students. This resource is new, as far as I know, and I definitely plan on using it this year.